With most teams about to get their eighth game in the books this upcoming weekend, we’re getting to the point where we can begin to get an idea of how randomness is affecting the NFL. In some cases, it’s because teams have done so well in a small sample size that it will be impossible for them to keep that rate up over a bigger one; in others, it’s because we’re beginning to build a large enough sample that we can get a grasp on what’s real and what’s not. Eight games might not sound like a lot, but that’s right around 100 possessions and 500 plays from scrimmage on either side of the ball for most teams. Of course, we can use that information about randomness to get some insight into whether certain teams have been “luckier” than others over the first half of the season. Luck is a tricky word in terms of football, and it has to be taken with a grain of salt. Take fumble luck, for example. Fumble luck is the idea that no team in the league recovers a particularly high or low percentage of the fumbles in their games, year after year. There may be years when a team like the 2009 Jets recovers 70 percent of its fumbles, and it might even repeat that number the next season (as the Jets did in 2010), but that recovery rate won’t stick around for half a decade or anywhere close. A team like the Bears is likely to recover a lot of fumbles, year after year, because they force a lot of fumbles, and forcing fumbles is a far more consistent skill. (Just ask Charles Tillman.) They won’t recover a disproportionately high percentage of those fumbles, though. It’s also important (if admittedly tedious for the regulars) that the idea of some player or team benefitting from randomness in a certain sample doesn’t mean that the team is going to suffer from bad luck in that same category in the near future! If the Jets recover 70 percent of the fumbles in their games in a given year, it doesn’t mean that they should expect to recover some really low percentage of their fumbles in the following season. That’s the gambler’s fallacy, the idea that a team is “due” for good luck or bad luck. The truth is that the Jets aren’t any more likely to recover 70 percent of their fumbles in a given season than they are 30 percent, or any more likely to recover 60 percent of the fumbles than 40. Over a long enough time frame, we would expect to see the Jets recover just about 50 percent of the fumbles in their games. That’s the concept of regression to the mean. So, with those cautionary points ringing in your ears, let’s take a look at how the league has been affected by randomness during the first half of the NFL season. And since it just came up, let’s start with that wonderfully meaningful bit of fumble luck. The patron saints for the meaningfulness of the fumble are this year’s Washington Redskins. As I wrote about after their loss to the Giants, they’ve lived and died by fumble recoveries this year, and the same accidental tactical weapon that helped produce victories for them earlier in the season came back to bite them in their narrow defeat by Big Blue. Even after that Giants game, in which they fumbled six times while recovering a universe-abiding three, the Redskins still lead the league in fumble recovery rate. They’ve picked up 16 of the 22 fumbles that have hit the ground in their games, producing a 72.7 percent recovery rate that leaves them as the only team in the league over 70 percent. Just behind them are the Rams, who have picked up nine of a league-low 13 fumbles in their games this season. That figure comes about as a result of the defense, which has just two forced fumbles all season despite an above-average sack rate. The league average is 9.8, and nobody else in football has fewer than six. 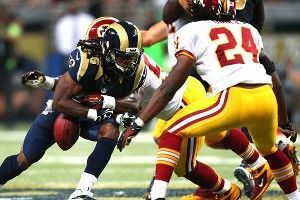 I did mention earlier that forcing fumbles is a skill, but even skills are subject to some randomness; merely by virtue of a helmet being in the right spot or a punt returner dropping a ball, the Rams simply have to have more fumbles in their games over the second half of the season. The team with the most fumble-happy games, San Diego, has recovered 14 of the 28 free balls in their games. That’s exactly half. The unluckiest team in the league is one you’ll see come up once or twice in this column as a team of extremes. The Broncos saw their luck seemingly bounce back in the second half of their game versus the Chargers, but they still rate out as the most fumble-unlucky team in the league, having recovered just five of the 22 pigskins up for grabs in their games (22.7 percent). Behind them are the Chiefs (26.1 percent) and then the Dolphins (27.3 percent), who are an interesting case in terms of this sort of analysis. When I wrote about the Dolphins as a possible sleeper team before the season, I mentioned that the Miami defense had recovered just one of the 12 fumbles that had occurred in their games during the previous season, which was probably the lowest total for a team defense in NFL history. The Dolphins aren’t much better this year, but they absolutely have improved: Miami’s defense has forced 12 fumbles in seven games this year as opposed to 16 all of last season, and while they’ve only recovered three, 25 percent is better than 8.3 percent! If you’re a Cowboys fan who feels like your team deserves a break, well, here’s some good news. Through the first eight weeks of the season, according to Football Outsiders, no team in the league has played a harder schedule than the Cowboys. When Dallas’s opponents have played teams besides the Cowboys, they’ve gone a collective 21-16, which is roughly the equivalent of Dallas going up against a 10-6 team, on average, each week. That’s not fair, and with the 7-0 Falcons up next for the Cowboys, that figure is only going to look worse. The good news, though, is that they play the league’s sixth-easiest schedule over the second half of the season! That will be even easier once the Cowboys get past their tough matchup with Atlanta. Another team with a notable strength-of-schedule split are those pesky Broncos, who had the league’s toughest projected schedule heading into the season. After going up against the league’s seventh-most-difficult schedule through this past week, no team in the league has an easier slate over the final nine weeks than Peyton Manning’s boys. They still have two games left against the Chiefs to go along with matchups versus the Panthers, Browns, and Raiders. That’s a lot more fun than playing the Texans and Falcons. The Jets (fourth through today, 29th afterward) are the third team in this group. The life-isn’t-fair award belongs to the Rams, who don’t seem to get any letup. After playing the toughest schedule in the league last year, they’ve faced the second-most-difficult schedule in the league through seven weeks. After this point, they’ll face the fifth-most-difficult schedule in the league. The Cardinals are in a similar boat, having played the fifth-most-difficult slate, and are about to play the second-toughest schedule over the rest of the year. On the flip side, it’s good to be a Steelers fan. Pittsburgh’s schedule has been the seventh easiest in the league so far this season, and after today, Football Outsiders projects it to be the third easiest over the remaining nine weeks. That’s not bad at all. If Pittsburgh’s too cold for you, you might also consider cheering for the more temperate slate enjoyed by the Chargers, who have faced the third-friendliest schedule in football so far and will finish with the eighth-easiest grouping. If you’re looking for a sign of impending danger, the NFC North is the place to be. While the Packers and Lions don’t have dramatic shifts about to pop up in their schedule, the rest of the division isn’t quite as lucky. This one’s simple enough: The Vikings have had the league’s easiest schedule through eight weeks, but they’re projected to have the NFL’s most difficult remaining slate over the final nine weeks of the year. The first half’s surprise contender still has to play Green Bay and Chicago twice each, and those games go along with contests versus the Seahawks and Texans. The Bears’ schedule isn’t much more fun, as it goes from 28th in the league to fourth. Of course, the difference between average (2-2) and lucky (3-1) is one win, so it’s not very fair to say that a team like the Vikings has been lucky to do so well in close games this year. But it might be fair to start thinking that about the Falcons, who have gone 4-0 in one-score games, including a three-week stretch that included wins by a combined 12 points over the Panthers, Redskins, and Raiders. On the other extreme are those Panthers, who deserve a little bit of luck one of these days. National fans might remember the blowout by the Giants from Thursday night and presume that the Panthers are just worst-team-in-the-league candidates, but the 1-6 Panthers haven’t had an embarrassing blowout loss besides that one. Their five other games have all come down to one-score totals, and Carolina has lost each of them. A team that forces a lot of turnovers is more likely to create a scoring opportunity than one that doesn’t, but that’s not enough to explain how ridiculous the Bears have been this season. Through their first seven games, the Chicago defense has scored six touchdowns. That’s 36 points! Lance Briggs has more touchdowns than Calvin Johnson! To put that in perspective, the highest-scoring defense in recent memory was the 2010 Cardinals, and they finished the season with 48 points (eight touchdowns). In 2009 and 2011, those same Cardinals combined for a total of two defensive touchdowns, which should tell you all you need to know about how random this is. The Bears have averaged three defensive scores per year under Lovie Smith, never finishing with more than six, but they’re currently on pace to hit 18. Needless to say, this is unprecedented and sure to slow down over the final nine games. Because the Bears have only had one touchdown scored on them by opposing defenses, they have a plus-30 margin in terms of defensive scoring, which is the best rate in the league. Just behind them are the Texans, who have four touchdowns scored on them without allowing one so far this year, for a margin of plus-24. The only other teams in double digits on the positive side of the ledger are the Redskins (plus-18) and Broncos (plus-12). The unlucky team on the other side of the coin? Why, that’s our old embattled friends the Dallas Cowboys. The revamped defense in Texas has not scored a defensive touchdown yet this year, but Jason Pierre-Paul’s pick-six on Sunday marked the fourth touchdown a defense has scored against the Cowboys this season. That leaves the Cowboys alone at the bottom of the table, floundering at minus-24, just ahead of the Bengals and Jaguars at minus-18. The Titans, Eagles, and Lions are at minus-12. Finally, let’s finish up with the most nonsensical skill of all. Outside of their ability to block kicks and the weather patterns of the city in which they play, teams have no ability to prevent opposing kickers from hitting or missing field goals. It’s totally random. Last year, the Eagles had the “best” field goal defense in the league, allowing only 16 of 24 kicks (66.7 percent) to go through the uprights, while the Jets — in the same area of the country — were subject to 29 of 30 field goals (96.7 percent) turning into successes. So far this year, the Jets have “allowed” only 17 of the 21 field goals against them to go through, an 81.0 percent clip that’s below the league average of 87.9 percent. The Eagles? Teams are 19-for-20 against them. That’s 95 percent. Honestly, there’s no skill with this stuff. So who’s been unlucky this year? Well, there are eight teams that haven’t seen a single kick missed against them this year, ranging from the Redskins (with 17 field goals attempted and converted against them) to the Chargers (who have held teams to only four attempts). In between there are the Seahawks, Cowboys, Steelers, Patriots, Broncos, and Texans. Teams having a more enjoyable experience when opposing kickers line up? They start in the AFC East, where the Dolphins have induced six misses on 20 attempts for a 70 percent conversion rate. Just behind them are the Bills, against whom opposing kickers are 8-for-11, which is 72.7 percent. The only other team with five misses or more against them are the fifth-place Lions, who have successfully faded five of the 21 kicks against them.